Prior to launching the marketing campaign for your newly licensed NCE, it is imperative to conduct team interviews to identify the target audience, knowledge gaps and blind spots from historical marketing campaigns. These interviews could be one-on-one structured or semi-structured conversations. Extended interviewing of consensually selected healthcare payer industry experts with adapted questions could also be performed for refinement and reflection of the internal findings. Focus groups/structured meetings consisting of 5 to 10 team members each from a different target market segment or a cross-section of a value chain could also be conducted to brainstorm a storyline and develop content. As a further refinement strategy, surveys of closed research instrument design will test attitudes and perceptions on both the current pharma product offerings and clearly defined future ones to a selected pool of healthcare payers. The objective here is to check on congruency of the story development with the attitudes and perceptions of payers or more simply put that the communication objective is synchronized with needs of the healthcare payers. Conducting a structured audit on current marketing materials will identify the key elements of a Plan Do Check Act system as well as ensuring that there is a “fair balance” in line with the FDA for the appropriate marketing pieces. Based on the above findings and from evaluation of in-house “STP” – Segmentation, Targeting, Positioning tools, a campaign road map can then be constructed. It should be unique – We will come up with some unique names for your product so that when someone says the name, they mean your product. This will also help in search statistics. Our brand name candidates will be short, punchy and memorable as this will make it easier for people to remember your product. It should look good written down and sound “cool” to say – We will ensure that your brand name will “jump off the page” and stand out next to all the other boring words around it. When someone says it in a sentence, it should stand out so that everyone around pays attention. It should evoke an emotion, a feeling or an idea – The brand name should be emotive and inspiring, it should tie back into what your product or service is, what is the feeling you want people to have when experiencing your product or service, and/or what idea are you trying to get across. We will follow similar constructs in coming up with suitable tagline variants for the brand as well. The tagline will combine these two elements: the mission of the product or service and the promise of it. Using the above brand equity framework, design proposals for both logo and tag lines should be shared with internal stakeholders and a consensus decision in line with the communication objective(s) to the healthcare payer, will be reached on the logo and tag line adoption. 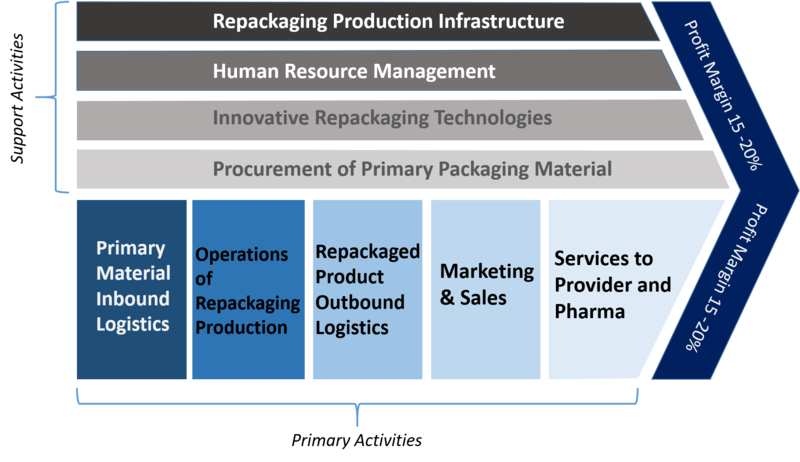 Pharmaceutical repackaging has become a growth market amidst an increasingly patient-centric healthcare market for a number of reasons: to fit with the dosage and formulation needs of different patient groups; to reduce treatment administration errors associated with doses in liquid form at the point of patient care; to eliminate residual quantities of addictive prescription medicines; to improve patient compliance by resizing or reformulating in more convenient dosages; or for improved convenience to the healthcare practitioner by changing the method of administering to a patient; and lastly but certainly not the least is the importance of reducing cost. In some cases, however, the market opportunities for repackaging are less clear. By conducting interviews and online surveys with the 4Ps (Patients, Providers – Drs., nurses etc., Payors – health insurance providers and Pharma – supplier of primary packaging material) of the healthcare sector, i3 Consult can achieve a 360o perspective on the pain points and opportunities for establishing a USP (unique selling point) in your pharma repackaging space. i3 Consult can also solicit primary and secondary research to establish a predictive value of plastic bottles being used as packaging for your oral drugs distributed in bulk and prescription dose volumes to retail and mail order pharmacies and conduct a competitive analysis of other innovative packaging methods. Although blister packaging is likely to maintain favorable growth based on its adaptability to unit-dose formats with expanded-label content, high visibility, and built-in track-and-trace features, there are other innovations which need evaluation to optimize the client’s market position and marketing mix (MM). For example, Dupont’s Surlyn® offering high patient visibility, significant weight and volume reduction as well as related pharmaceutical pouches are forecasted to expand in the pharma repackaging space and hence a feasibility study may need to be conducted around these opportunities. 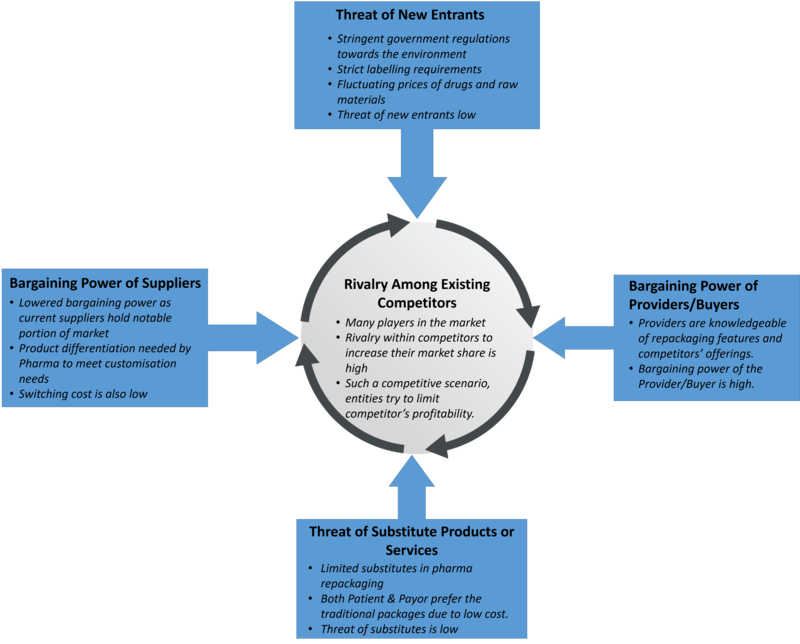 I3 Consult as part of its competitive landscape analysis can establish what product repackaging elements have become the essential part of the drug delivery system as well as the core elements of the MM. In today’s patient centric healthcare market, Providers have found in-house dispensing as a new revenue stream as well as achieving greater compliance and outcomes. i3 Consult will establish for the client an optimal market position with in-house dispenser partners (selected Providers) and Pharma vendors. After conducting an in-depth value chain (figure 1) and competitive landscape (figure 2) analyses, a comprehensive road map will establish both the optimal MM and USP impacting on value-added service for Patients which in turn will distinguish the service and product among the client’s competition. The Challenges: For a fast-growing medical device company having a global presence, there are challenges both internal and external to the organization. Being responsive to the regulatory, quality and safety issues, across multiple global markets can be overwhelming to the executives of a small cap medical device company. Internally medical device company executives are held accountable to reach certain milestones set by Director of the Board (e.g. study completion, licensing approval in key markets, publication of proof of concept data, sales turnover targets, to name just a few) and/or are tasked to deal with company-wide issues which may be either technical, regulatory, or business related. Outsourcing to a consultant with vertical knowledge in a specific functional area is a standard approach in systematically trying to meet the milestones set or deal with the issues faced. Often however, faced with the challenges of trying to integrate this consultancy-based decision making, using the so-called compartmentalized approach, results in milestone shortfalls, critical success issues being only partly resolved or remaining unresolved, protracted timelines, and overspending of the corporate budget. An Optimal Strategy: A small cap medical device company needs to have its organizational structure, functional roles and a comprehensive set of SOPs in place developed from their regulatory strategy and quality management system. Their regulatory strategy and quality management system can be developed from a cross-functional structure of their organization which would co-ordinate the functional area talent focused on sharing the ‘Bigger Picture’ of long term corporate goals. This approach of tying in structure, functional roles and SOPs with regulatory strategy and quality management systems has repeatedly proven effective in putting medical device companies on the ‘fast track’ for cost and risk reduction as well as championing the competitive advantage. 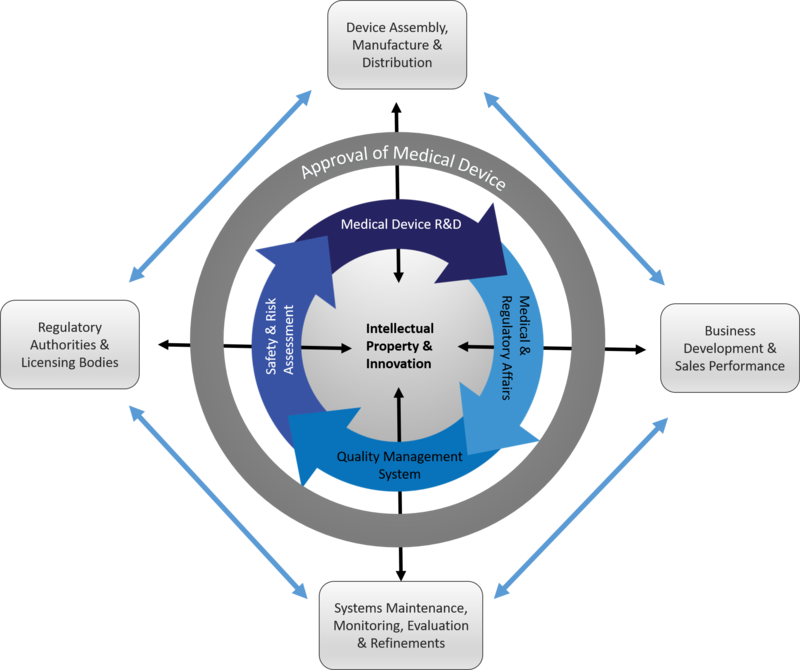 Action to be Taken: It is proposed to the small cap medical device company, in all three areas of structure, function and responsibilities of its organization, development and deployment of an appropriate regulatory strategy, the most efficient and compliant quality management system, and then to aggressively execute these actions needed to demonstrate product efficacy and safety under a corrective feedback system. Specific structures, functions and responsibilities for middle to executive management levels are needed to ensure that there is a seamless work flow in and around the components of the organizational structure shown (Figure 1).